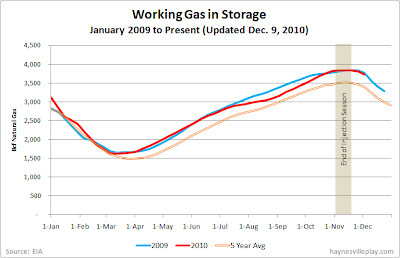 The weekly EIA working gas in storage report showed an 89 Bcf decrease, bringing the level of gas in storage to 3.725 Tcf. The weekly withdrawal was greater than last year's (-57 Bcf) and the five year average (-74 Bcf). Current storage levels are 1.5% below last year's level (-57 Bcf) but still 9.8% higher than the five year average (+332 Bcf). Low temperatures drove the higher than average withdrawal, as the week's temperatures were 5.1 degrees below last year's and 1.9 degrees below normal.